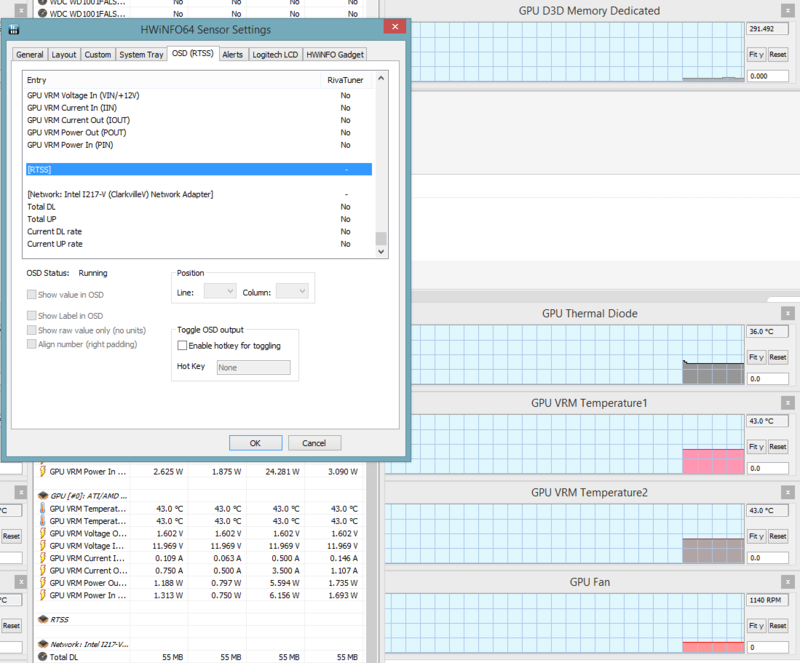 HWiNFO32/64 now introduces the support of RivaTuner OSD (Statistics) Server which allows displaying of any HWiNFO32/64 sensor values in DirectX applications/games. Download the latest HWiNFO32 or HWiNFO64 version (v3.81 at least). Besides HWiNFO32/64 you need to have the OSD/Statistics Server running as well. This is included in any of these packages: RivaTuner or EVGA Precision or MSI Afterburner. Download one of them (any you prefer) and start the Statistics Server before opening HWiNFO32/64 Sensors. In HWiNFO32/64 go to Sensors/Configure and set your preferred values to be included in the RivaTuner OSD - for each value needed to be shown in OSD click "Show" in the RivaTuner OSD section. Many thanks to Alex (aka Unwinder) for making this possible ! Posted build 1271 which allows to display more than 7 values in OSD. The values selected are displayed in order as shown in HWiNFO32. RTSS OSD feature is now included in the stardard Beta release of v3.81 (or later). Intermediate Build 1271 has been removed. new to HWiNFO but stumbled across the new feature of forwarding hwinfo's sensors to rivatuners statistic server. as i have some experience with rt and plugin programming for rt i could not resist to give hwinfo a try. in order to make this feature more usable you might add sensor names to szOSD in rtss shared memory. recommend using "Current Name" to have the ability to further customize osd display. the only limit here is the total length of the string. remember szOSD is an array of 256 chars. I'm planning to release it tomorrow with a new Beta release. When many sensors with labels are present the output is truncated (see attached screenshot). There is currently a limitation of 255 characters for the output. Try to rename the sensor titles (e.g. to "C0%", "C0T", "SysT") and so get more information displayed. A small request/question. Can I group on one row multiple information? In fact I want that for one row to have temperature and core usage so instead 8 rows I'll have 4. I'm sorry, but currently you can have only one value per line. Multiple values per row is a planned feature. I have just released Build 1390 which allows now to include multiple items per one row. Just select the same line number on items you want to have there. The label used on such a multi-item line is the first one in the list and each item is added in the order in which it's shown in the sensors list. What can I say? Works as intended. Thank you and God bless you. Now my OSD looks nice. Has HWiNFO64 lost the ability to show the RTSS (OSD) Graph...?? Try to run some graphics application that will trigger showing the FPS. Or check the latest Beta build, if that will show 0 FPS when no such application is running. The RTSS "own statistics" server is running. And if you check back in HWiNFO, do you see any FPS value there? (06-23-2015, 06:45 PM)Martin Wrote: And if you check back in HWiNFO, do you see any FPS value there? OK, I have done a few tests and indeed, there seems to be a glitch in recent versions of HWiNFO. I'll release a new Beta build in a few hours, that will fix this problem. Thanks for reporting. The rtss default polling rate is 500 ms so I change the "scam interval" of HWiNFO to the same to be sync any backward with it... ? ?